The summer went away, barely bringing warmth and joy, the summer went away, without looking back, let the doors open for melancholy and sadness to settle. Autumn has arrived, temporary as expected, surprised the heart with hope and affection and let the sadness drain away. Intense autumn, explorer, hot, friend, flavored. The window sometimes open, sometimes closed, revealed the short days, hidden in the night that so soon got used to arrive. The gray days became more frequent, the sun was losing the space to shine. The heart was warm, the body was hot, the mind remained hot, except the hands, which insisted on bothering. Autumn is gone, this time the melancholy that had remained hidden got some space to unfold. We were at the hey-day of the latest European fall, the temperatures dropping day after day. 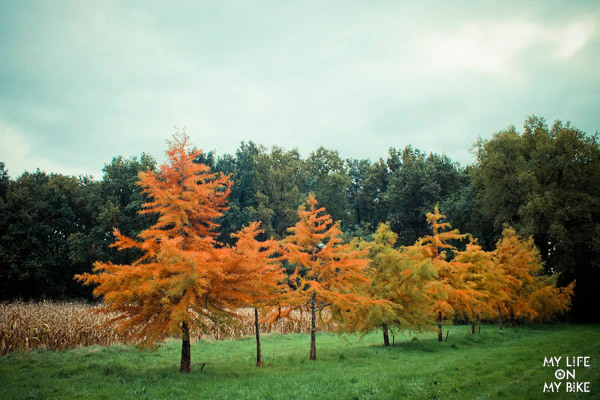 The mostly yellow leaves, sometimes green and red, slowly began to fall and cover the ground, forming a natural patch-work, as a reflection of the tree itself in gray days without sunshine. It was a joy to watch the transformation of this beautiful spectacle of nature, my heart was pounding, but also with a bit of affliction, an early feeling of longing, knowing that soon there would only be the dry trees, without color, surviving a cold and rigorous winter. 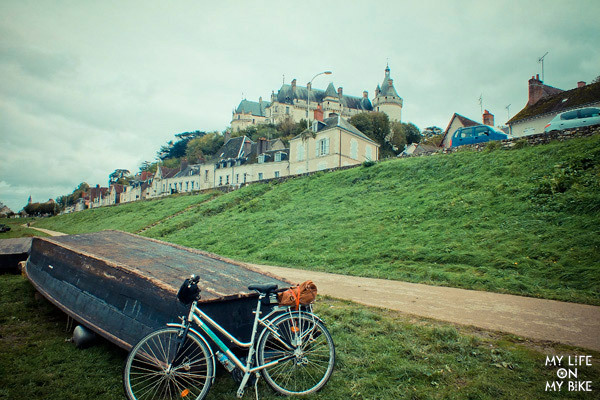 I decided to travel, travel alone, travel in France and travel by bike. I wanted introspect, reflect, isolate myself, without planning too much. Maybe a subjective desire to emotionally prepare myself for next season that was about to come. 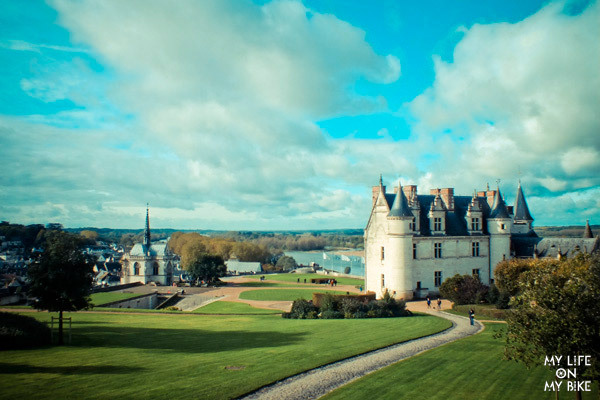 The Loire Valley was my destiny, a magnificent region in central France, which mixes the longest river in the country, with vegetation, forests, castles, medieval towns and lots of wineries. A landscape that inspired many writers and poets during the Renaissance and that was declared a World Heritage Site by UNESCO in 2000. 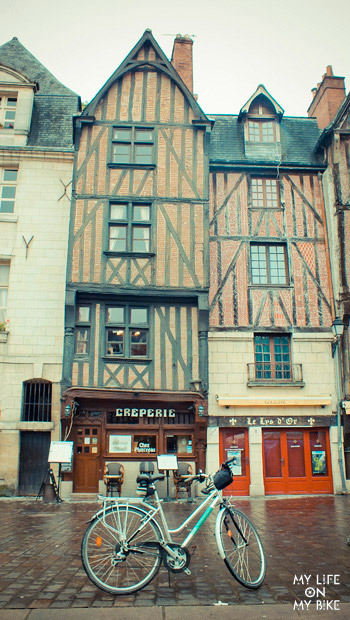 I took a train and I went to Tours, 250km in the south of Paris. Getting there, I rented a bike and found a cozy place to stay. 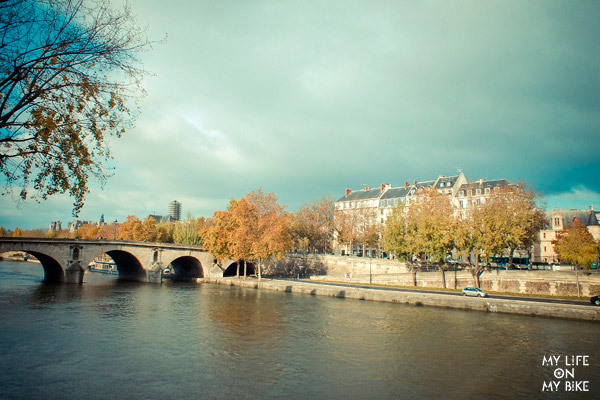 Tours is a very pleasant city, with an old downtown comparable to Le Marais in Paris, where the crypt of Saint-Martin is, the merciful saint, who died in 397. Everything was going well and for the first time I felt some prejudice for traveling alone, when a table in a restaurant was denied to me, just because I was alone, but I did not let it overwhelm me. The next day, it was time to start the bike trip. 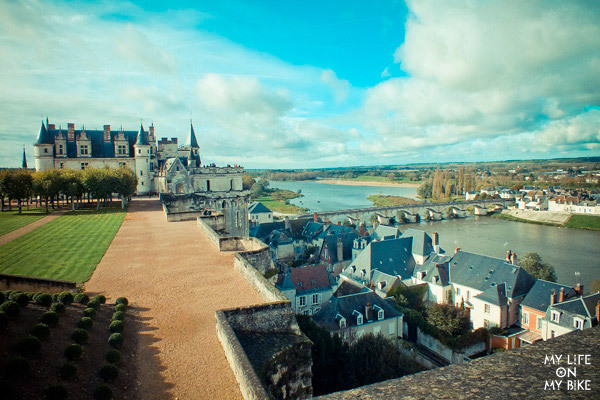 I decided to go to Amboise, 25 km from Tours. It was a holiday; I stopped at a local bar to have some coffee before taking the bike path. As I entered, I saw a huge pot of potatoes with sauce being served on that cold day. The locals seemed to enjoy it and were curious about my solitary presence and wanted to know what I was doing there. 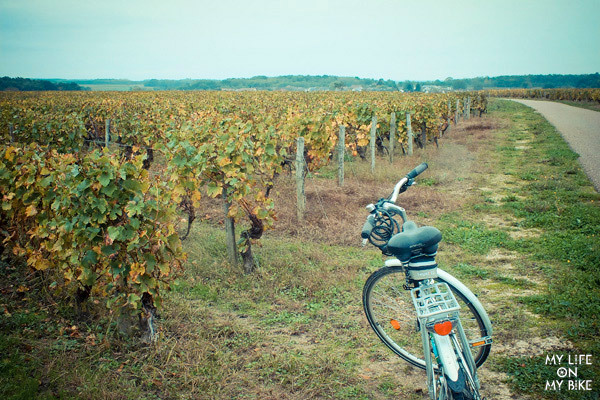 When I told everyone I was going to travel by bike around the Loire, people look at me startled, whispered to each other and asked me if I was not afraid. On the contrary, I felt full of courage. 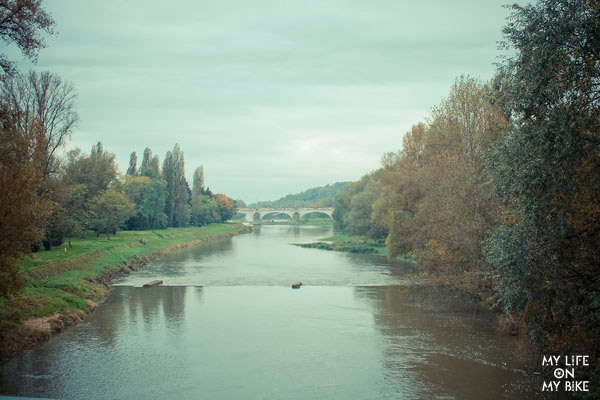 Although it was something for my self-benefit, I felt like Joan of Arc, fearlessly braving the Loire Valley. Time to go, in an unsuccessful attempt to visit a cave in Vouvray, I cycled 10km without getting anywhere. I returned to Tours at the starting point. Now yes, I thought, I’m on the right track towards Amboise. 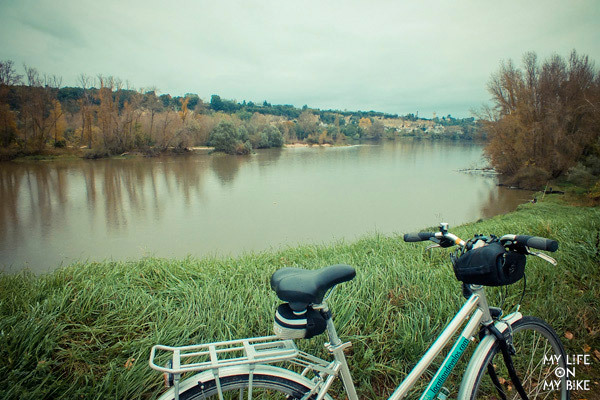 So the adventure began, pedaling the riverbanks in the wild Loire, breathing clean air, accompanied by a silence that brought peace to my busy being. When the bike path took me forcibly off the river banks to cross a tiny village, a rain, thin and cold, softly had started. I had no choice, I had to keep biking, no open commerce, no balcony, no one, absolutely no one who could give me shelter. The fear and the cold increased slowly, but for the first time during the journey, I was surprised by a beautiful plantation of grapes on the way. Looking at that huge plantation in an endless horizon made ​​me forget the cold and fear, filling me with courage to continue my trip. But the rain gave no respite, even if it was a thin drizzle, a few miles from Amboise, my body began to feel desperate for shelter and hot water. Peace was totally away, I had to control my mind and my emotions not to freak out. The strategy was to start using my imagination, dreaming of being heated, next to a campfire with someone to care for me… a dream ironically contrary to the initial idea of ​​isolating myself. 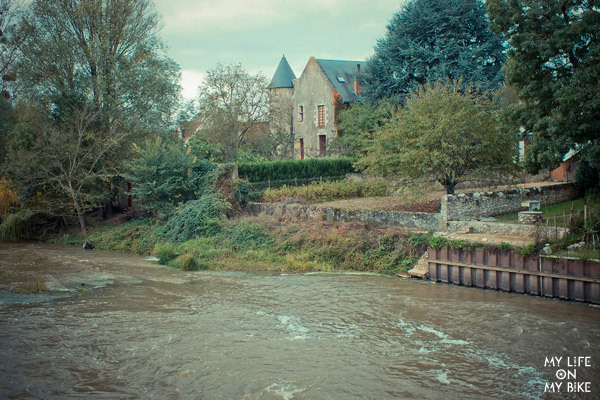 And so dodging my mind and my body, which were in their physical and emotional limits, I arrived in Amboise, beneath a torrent rain. When I found a shelter, I was bailed out by a group of lesbians who warmly offered me coffee and cake. Later, while checking my phone, I had received an invitation, a friend who lived not far away, got in touch and invited me to visit him at his home. Although I hesitated to accept the invitation, after all I had the initial purpose of isolating myself, I ended up accepting it. My imagination that afternoon, during difficult times riding in the rain, slowly began to become a reality. First, placing me next to a campfire, inside a huge, warm room with warm people and enriching conversations. 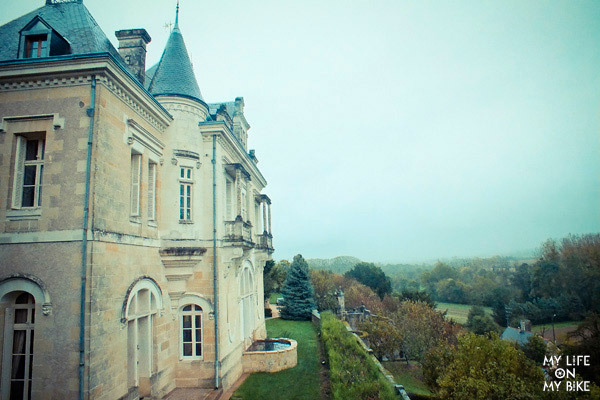 My friend lived in a castle in the Loire. The next day it was time to continue the trip. 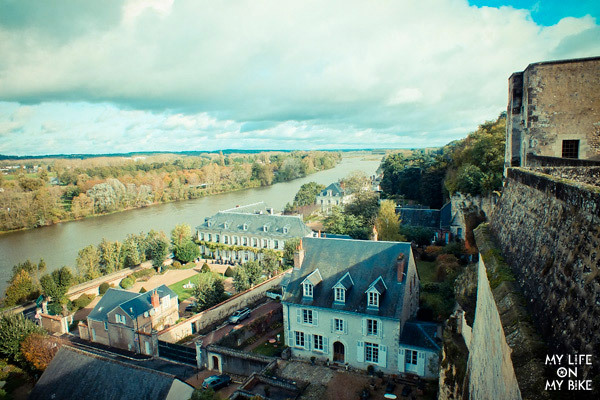 I left the comfort of the castle, and I came to visit the charming village of Amboise. I stayed just a few hours in the small town, gifted by a brief blue sky I visited the main castle and the Clos Luce castle, where Leonardo da Vinci lived for three years until his death in 1519. 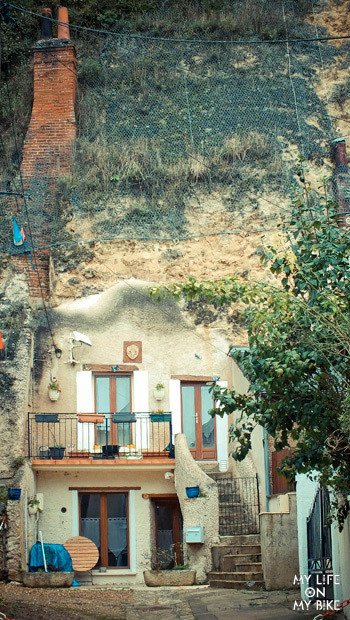 This small village put me face to face with a very kind gentleman who lived in one of the few houses built into the rock. The gentleman used to invite people curious about the architecture to come inside the house. His greatest relics were books and books where people around the world who passed by left messages in their native languages. After a few minutes of visiting, I decided to write something in Portuguese and surprisingly without much reflection, words and more words began to be written by my fingers with the voice of my heart, words of love and hope. I told the old man that I had a long drive ahead, 42 km to arrive in Blois. The kind man gave me one croissant and told me to be careful – with a beautiful smile on our faces I parted. Those minutes were energetic and gave me the courage to move on. 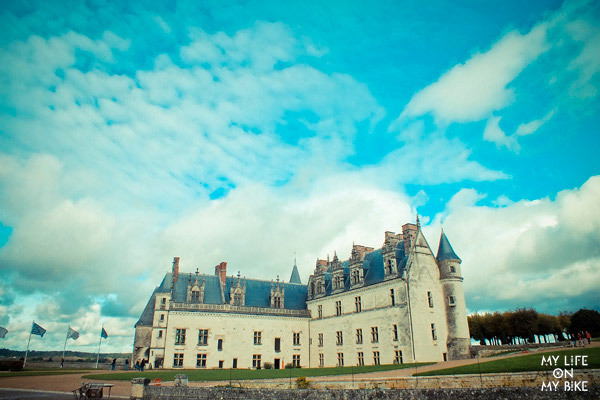 When I was leaving Amboise, I looked up and the sky had changed and it was completely black. At that day my only wish was that the rain would let me ride in peace. My wish was granted, but still with cold and fatigue for a few moments, in general this ride was tranquil. 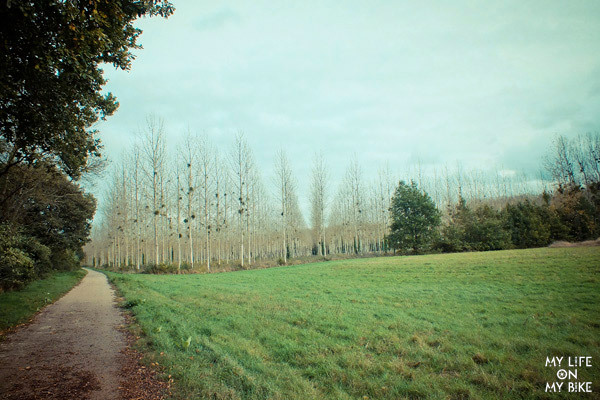 I crossed ghost villages, many plantations of grapes, climbs and descents that thrilled me and made ​​me want to scream, colored and white pine, horses, sheep, small castles, proving the wild beauty of the Loire. In some moments, when I walked into the dense forest stretches, the fear returned to dominate me, after all I was alone, the bike could break, many leaves and branches on the ground, derived from an intense autumn, covered my path. 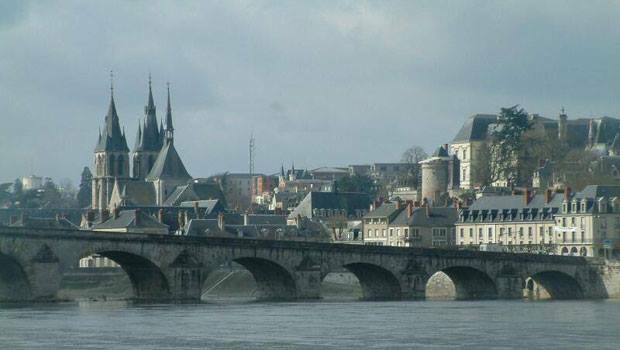 Exhausted again, as in the preceding day, with an intense mixture of fear and joy, I finally saw the city of Blois, on the margins of the Loire. I stopped briefly to thank the Universe for my life. I opened my bag and I devoured my croissant, the present from the man of Amboise. I realized why everyone looked at me frightened at the bar on Tour, I was traveling alone, by bike, in a season of the year that is not very favorable for a such thing, during my commute on the bike I did not find anyone doing the same I was doing. With the sense of accomplishment, after traveling for two days completing a journey of almost 80km at The Loire Valley, I returned the bike in Blois, took a train and went back to Amboise. I returned to the castle, where I lived an intense weekend, surrounded by many works of art by great artists, many of whom I already had the pleasure of meeting. 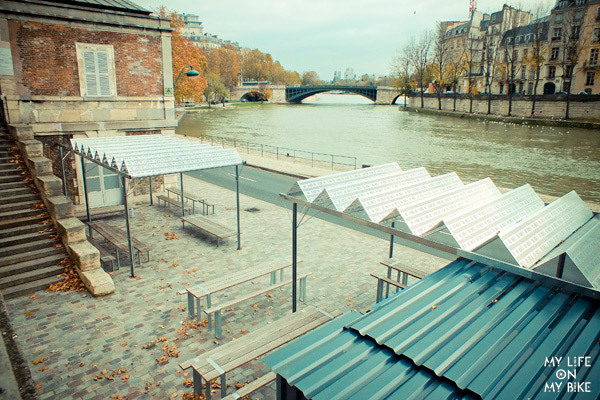 Organic food, local wine, good conversation and a love from Paris that came to keep me warm. The wisdom of the universe teaches us that everything we desire in this life we will have, all things, before being materialized, was once a mere thought.